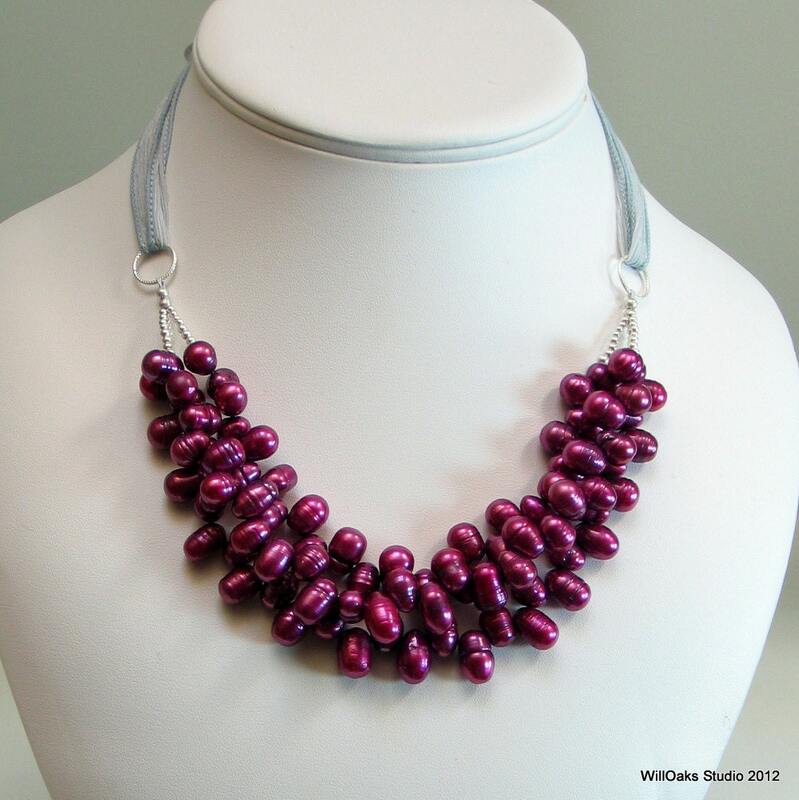 Celebrate Spring with a bright deep pink designer pearl multi strand necklace. 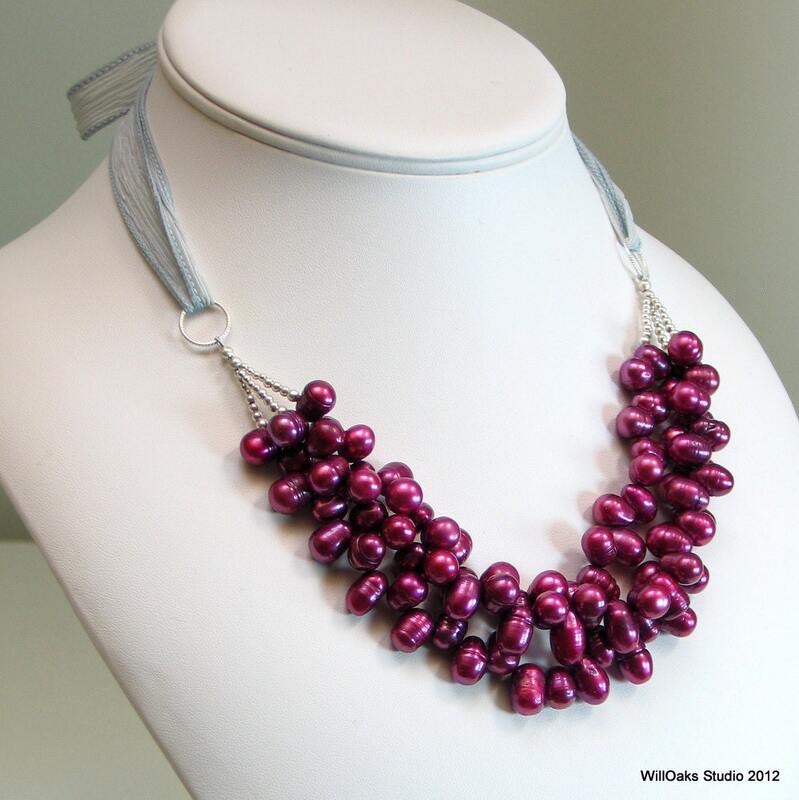 Large fuchsia pink freshwater pearls cluster in front, and a silk ribbon could be the "pop" of color that is the centerpiece of your warm season wardrobe. The rosy pink bib can be adjusted to wear at just the perfect length for a beautiful statement necklace. Tying the artisan dyed, hand made silk ribbon to different lengths brings the pearls to the perfect placement for different necklines. 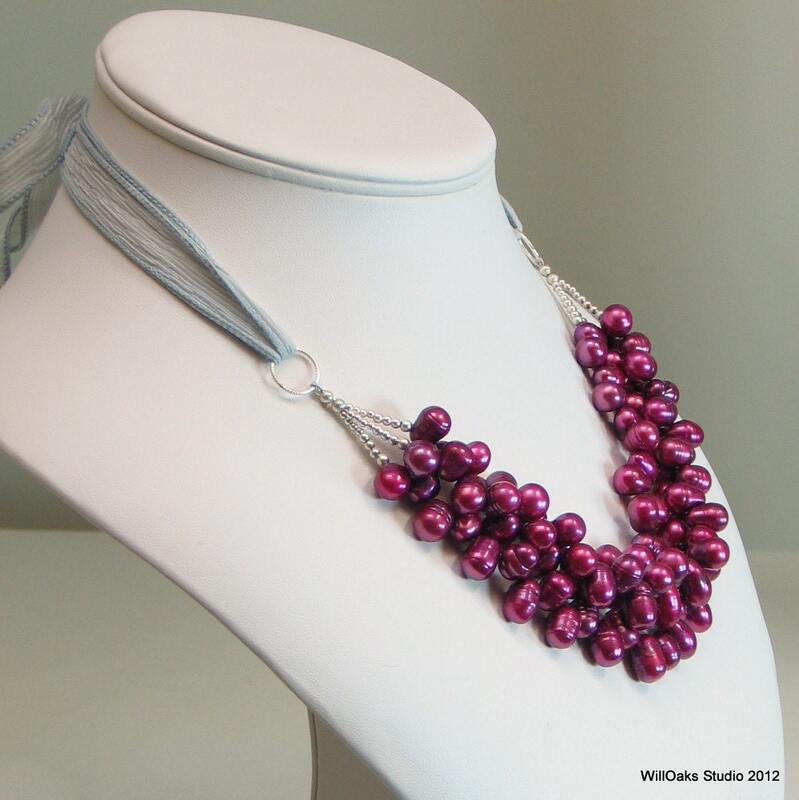 The dense cluster of rosy fuchsia freshwater pearls are bracketed with graduated sterling silver beads to connect to textured sterling silver rings that are 12 mm diameter. The large freshwater pearls are an average size of 11 x 8 mm each. The artisan dyed handmade silk ribbon is available in your choice of gray, black or hand painted shades of pink. And with this design, as with all my bibs, you can exchange this 42" ribbon for others of your choice. And consider these earrings, done in sterling instead of antiqued silver, to complete the look https://www.etsy.com/listing/97656431/ruby-crystal-drops-red-pearl-antique I can make any number of earring designs with pearls similar to those in this necklace, so convo me here on Etsy to discuss adding custom earrings to your necklace order. Easily adjustable from choker to opera length, to be worn with a bow or a knot, as you like it. The pearl focal point measures just under 10" long including the rings, and just over 1 1/2 " high in the front. And with the adjustable length, this bib will be pitch perfect for business or casual wear--so cute as an ascot behind an open shirt collar! Gorgeous. Wore this to work and got complements all day. Looks great with so many colors I like to wear. Grey, black, fuchsia really makes your outfit complete.